Say hello to smooth and supple skin! A favourite in COCOLAB, our Aromatic Body Oil is light on the skin but strong in the moisturising department. 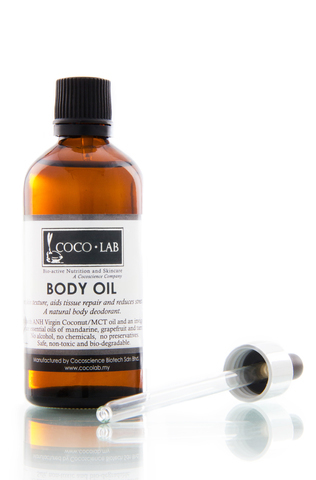 The Aromatic Body Oil prevents excessive water loss in skin, a major cause of skin dryness and dullness. It is formulated to be absorbed quickly into the skin but not lose any moisturising efficacy, promoting a natural healthy glow on skin. Use it as a leave-on massage oil or simply as a body moisturiser to prevent dry flaky skin. 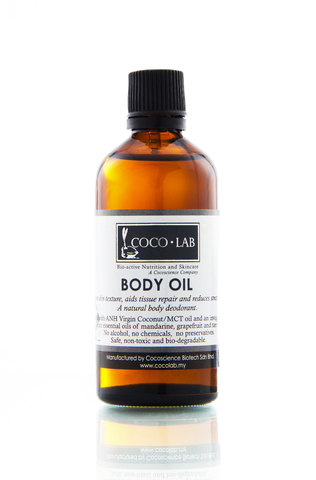 Its anti-bacterial, anti-virus and anti-protozoal properties give it a protective edge over normal body oils. Aids in tissue repair and reduces stretch marks. The Aromatic Body Oil is a natural body deodoriser without the danger of synthetic fragrances. This light formulation penetrates deep into the skin layers and is absorbed quickly. Considering smooth and velvety skin? Try applying the Aromatic Body Oil on damp skin and leave it on. Your skin stays moisturised for longer and prevents any excess water loss. Anybody who wants healthy looking skin. Suitable for babies because it is natural safe and non toxic. Suitable for adults and elderly folks whose skin needs extra moisturising. To subdue mild rashes, apply when necessary. INGREDIENTS: Contains ANH-VCO/MCT Oil and our signature invigorating blend of pure essential oils of mandarine, grapefruit and tarragon. Bottle comes in 100mL packaging. Apply onto skin and gently massage it into skin. Suitable for day or night use. Keep in a cool and dry place in an upright position. Do not place it under direct heat.